The Concise Edition is for shorter 1-2 unit courses or developmental students who need more time for reading. What's New in the 7th Edition Concise? If you are considering this text for possible adoption in your course, and would like a complimentary copy of new Concise 7th Edition, I can expedite a copy from the publisher and have it sent to you as soon as it is available. Rigorous scientific support for learning styles is lacking. Current research in neuroscience suggests that we learn best by using all the senses. Learning preference depends on what we are learning. See my blog with presents the research on this issue, "Are Learning Styles a Myth? If So, What Next?" Topics include college and career success. The career material in the online portfolio helps students to make an informed choice of their college major and career. It includes the Do What You Are (DWYA) personality assessment. The results of this assessment are linked to the O*Net database of careers for career exploration. It includes Simply Hired which helps students to find employment. Download this document: Student Learning Outcomes, Objectives, and Assessment for the new 7th Edition Concise. 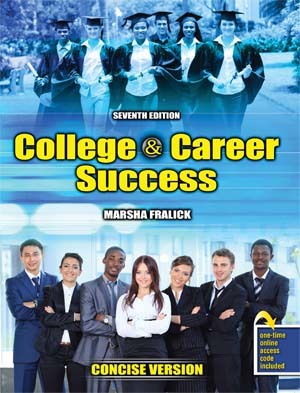 The Concise Edition focuses on college and career success with only 8 chapters as compared to the 14 chapters in the full edition. An interactive online edition is available, College and Career Success Concise Online. Contact me at marsha@marshafralick.com for an online demo.